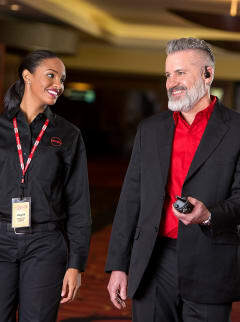 As an AMC theatre manager you’ll ensure the best possible out-of-home entertainment experience available. That’s what we do. We’re AMC, and we’re one of the largest entertainment companies in the world. You’ll be in charge of making sure the theatre runs smoothly so that every single guest enjoys the show, managing theatre associates and maintaining an environment that provides superior customer service. Sound hands on? It is. Pretty straightforward, huh? We think so. But we’re not looking for just anyone. Do you have what it takes? At AMC, we live in a team-based culture where a take-charge approach exists at all levels. Especially, when you want to take charge of your career. We offer continuous training and development programs, highly competitive compensation with performance-driven bonuses and excellent benefits including free movie passes, health and 401(k) plans. If working in the entertainment world, delivering superior customer service and a fun working environment matter to you, apply online today. You could end up working in show business.